Sree Vyas Puja Homage was read by Abhay Charan Das (His Divine Grace A.C. Bhaktivedanta Swami) before the members of the Sri Gaudlya Math in Bombay in February, 1936 on the occasion of the birthday anniversary of His Divine Grace Prabhupada Srila Bhakti Siddhanta Saraswati Thakur. Teaching Krishna Consciousness in America - Bengali poem were composed by Srila Prabhupada after he set foot in the west, Boston Commonwealth Pier at 5:30 am on September 17, 1965. But I know Your causeless mercy can make everything possible because You are the most expert mystic. The words of Srimad-Bhagavatam are Your incarnation, and if a sober person repeatedly receives it with submissive aural reception, then he will be able to understand Your message. "Sri Krishna, the Personality of Godhead, who is the Paramatma [Supersoul] in everyone's heart and the benefactor of the truthful devotee, cleanses desire for material enjoyment from the heart of the devotee who has developed the urge to hear His messages, which are in themselves virtuous when properly heard and chanted. 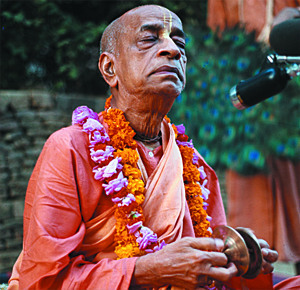 By regular attendance in classes on the Bhagavatam and by rendering of service to the pure devotee, all that is troublesome to the heart is almost completely destroyed, and loving service unto the Personality of Godhead, who is praised with transcendental songs, is established as an irrevocable fact. As soon as irrevocable loving service is established in the heart, the effects of nature's modes of passion and ignorance, such as lust, desire and hankering, disappear from the heart. Then the devotee is established in goodness, and he becomes completely happy. Thus established in the mode of unalloyed goodness, the man whose mind has been enlivened by contact with devotional service to the Lord gains positive scientific knowledge of the Personality of Godhead in the stage of liberation from all material association. Thus the knot in the heart is pierced, and all misgivings are cut to pieces. The chain of fruitive actions is terminated when one sees the self as master." How will I make them understand this message of Krishna consciousness? I am very unfortunate, unqualified and the most fallen. Therefore I am seeking Your benediction so that I can convince them, for I am powerless to do so on my own. Reference: Excerpts from The Jaladuta Diary, 1965 - Journey to the U.S.A. Prayer to the Lotus Feet of Sri Krishna - Bengali poem were composed by Srila Prabhupada aboard the Jaladuta on his way to the United States on September 13th 1965. Sri Srimad Bhaktisiddhanta Sarasvati Thakura, who is very dear to Lord Gauranga, the son of mother Saci, is unparalleled in his service to the Supreme Lord Sri Krishna. He is that great saintly spiritual master who bestows intense devotion to Krishna at different places throughout the world. As the vast mercy of Sri Caitanya Mahaprabhu conquers all directions, a flood of transcendental ecstasy will certainly cover the land. When all the sinful, miserable living entities become happy, the Vaishnavas' desire is then fulfilled.